Cancer metastasis causes 90% of all cancer-related deaths. 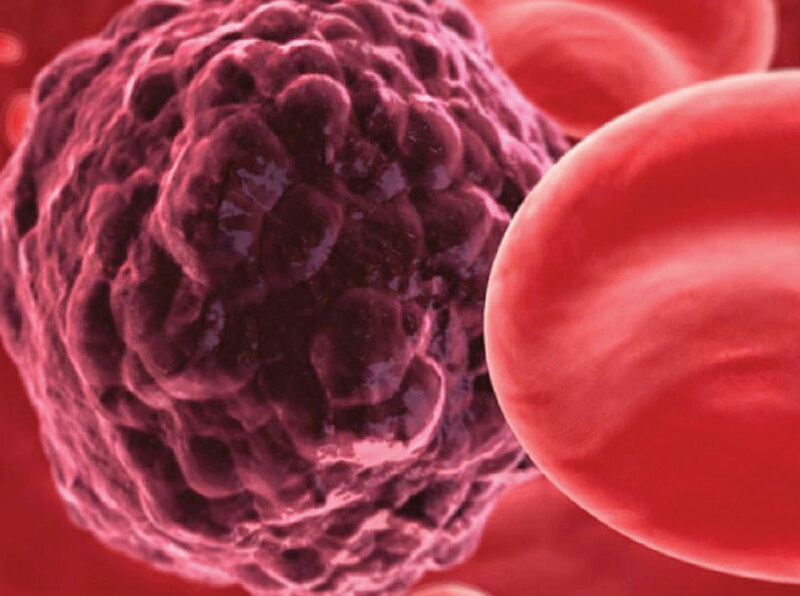 Scientists agree that the metastases occur when cancer cells are shed from the primary tumor, carried by the peripheral blood, and deposited at a distal site to create a new colony. An ability to etect circulating tumor cells (CTCs) or cell-free cancer DNA (cfDNA) in blood or saliva opens possibilities to suspect cancer even before it is visible on radiological images. Minimally invasive bodily fluid testing—dubbed liquid biopsies—allows for frequent testing for residual disease or cancer recurrence, and could be uniquely beneficial when cancer develops in sites inaccessible to surgical biopsies. But what is the best technology to capture and detect cancer material in liquid biopsies? Multiple creative approaches are currently being tested, jostling to reach the clinical diagnostic market. As a part of the liquid biopsy initiative, the laboratory created an efficient CTC-capture microfluidic device. The microfluidic chip consists of 50 monoclonal-antibody laden sinusoidal channels. This is of particular importance for capturing cells from clinical samples, which contain cells with a wide expression range of target surface antigens. Recent data support the claim of ~90% purity, superior to other existing capture technologies. The assay was tested in a proof-of-concept study to detect minimal residual disease (MRD) in patients with acute myelogenous leukemia (AML). Antibodies to three separate antigens (CD33, CD34, and CD117) were immobilized on the chips. Only 3 mL of whole unfractionated blood is required, underscoring the vital importance of liquid biopsies in the diagnostic workflow. As compared with the current diagnostic process, which includes bone marrow biopsy followed by flow cytometry, PCR, or cell staining, microfluidic surveillance presents a simplified, high-yield approach. In the published study, the team was able to perform 39 microfluidic tests as opposed to only 8 when using bone marrow biopsy–based tests. “Signs of relapse were identified faster,” emphasizes Dr. Soper. 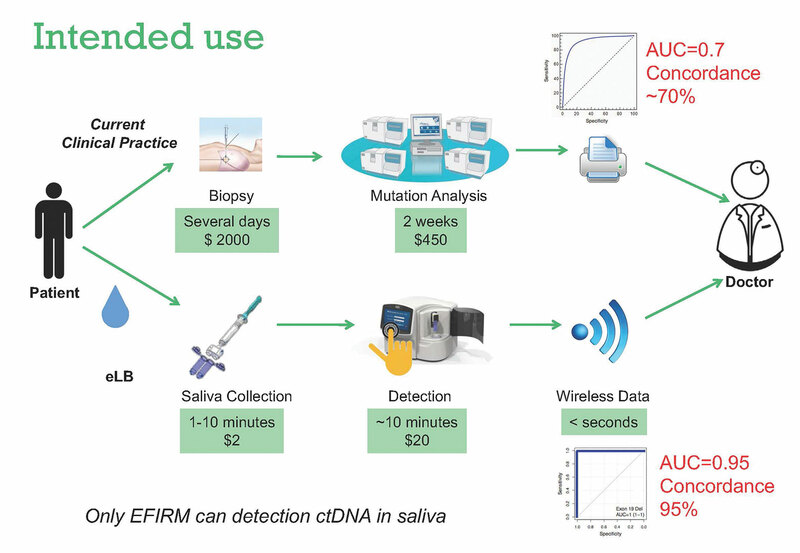 “Circulating tumor cells appear variably and unpredictably, such that MRD in AML can be detected at a treatable stage only by frequent sampling.” Dr. Soper’s newly formed company, BioFluidica, is dedicated to commercialization of the microfluidic chips for all three oncological liquid biopsy biomarkers (Figure 1). Epidermal growth factor (EGFR) mutations are commonly acquired genetic alterations in lung cancer. Molecular analysis for EGFR mutations is performed on tumor cells obtained via bronchoscopy, limiting its utility in diagnosis and prognosis. 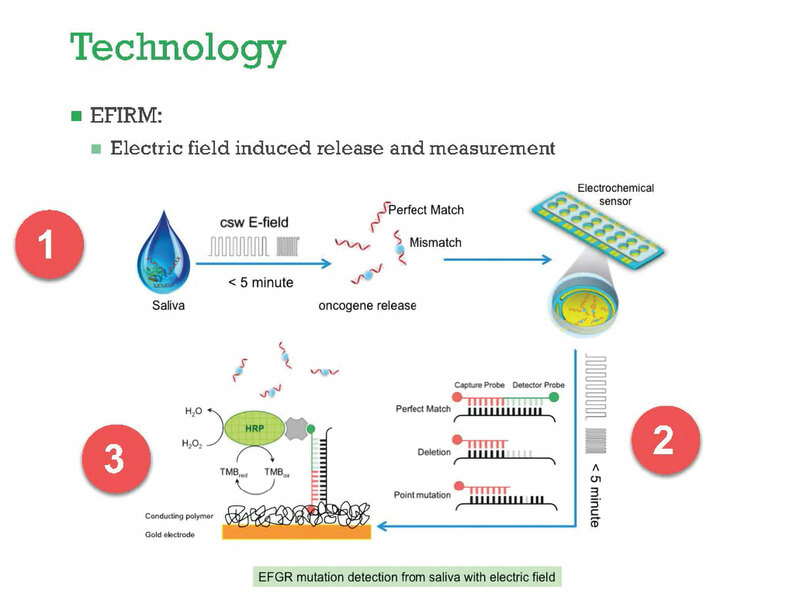 Electric field-induced release and measurement (EFIRM) utilizes an electrochemical chip in a 96-well format of bare gold electrode surfaces (EZLife Bio USA). Several pulses of electric field lead to polymerization of the capture probes onto the gold electrodes, which are hybridized only to mutated DNA. The detector probes, conjugated with horseradish peroxidase, are optimized to hybridize both wild-type and mutation DNA. Hybridization occurs when the targets are brought in the proximity of both probes during the positive phase of the electric wave. Unbound probes are washed away with the change of polarity. The pulses are just milliseconds long, and underpin the precise control of specificity and sensitivity of the EFIRM technology (Figures 2 and 3). The technology was tested in two prospective blinded studies of clinical saliva and plasma samples. The assays demonstrated high concordance with biopsy-based genotyping (96%). Moreover, the cancer-specific molecular fingerprints were clearly identified in pre-surgery samples, even though it is not yet understood how circulating DNA ends up in saliva. In the foundation of the miniature CTC chip is the hydrophobic layer of carbon nanotubes. Nickel and gold electrode layers are plated onto the carbon film, and covered by a protective polymer layer. Dr. Panchapakesan explains that even though the chip contains hundreds of microscopic wells bored into the polymer layer, it’s the hydrophobicity of the carbon surface that enables creation of a perfect droplet of blood. Unexpectedly, Dr. Panchapakesan’s team discovered that CTCs sediment to the bottom of the well faster than leukocytes, further increasing the chip’s sensitivity (Figure 4). The carbon layer is exceptionally sensitive to changes in electrostatic potential: Multiple random interactions of sample proteins with antibodies produces chaotic electrical signals. On the other hand, specific interaction of surface proteins on CTCs with capture antibodies results in a defined electrical signature. Dynamic time warping mathematical analysis is used to distinguish specific and nonspecific patterns. Static microarray separation has a unique advantage, in that it is able to isolate cancer cells that downregulated all cancer-specific surface markers, such as triple-negative breast cancer cells. A microarray covered with collagen matrix may be able to capture cells that escaped therapy, and be otherwise “invisible” to antibody-detection methods. According to the company, extensive optimization of every step in its AVENIO liquid biopsy workflow (for research use only) results in superior recovery rates, as evidenced by nearly 70% target DNA recovery at the recommended sequencing depth of 40 million reads. Significant error reduction is achieved by creative use of molecular barcodes incorporated into the DNA library adapters. Such barcodes enable the precise tracking of individual molecules, making it possible to distinguish true somatic mutations from artifacts. A complex barcode algorithm in the amplified library allows for precise reconstruction of parental double-stranded DNA duplexes.